Sky Sports Mix is bringing the magic of live sport to millions more Sky TV customers for the first time as the brand new channel launches today - opening a window on the amazing action shown on Sky Sports every day, and shining a light on sport not previously covered on television. As the feel-good factor around British sporting achievement continues following the Olympics, Sky Sports Mix will bring a huge variety of different sports to a whole new audience with an average of five hours of live action each day across the first month - and 16 different sports covered in that time. 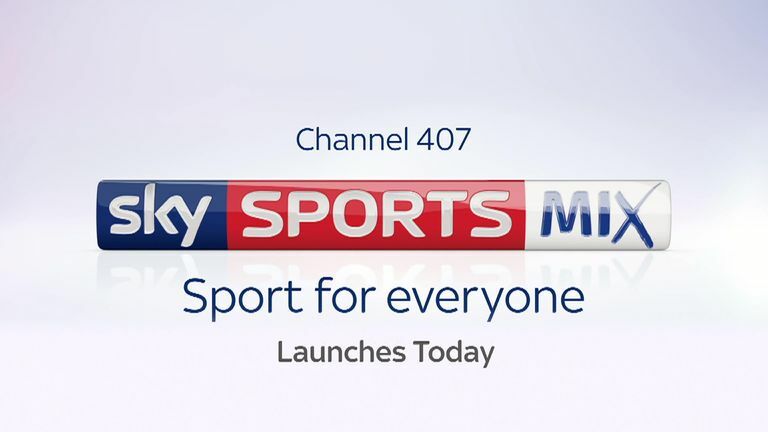 Cricket is the first live sport on Sky Sports Mix and the new channel can be found at 407, next to Sky Sports News HQ. England face Pakistan in the first one-day international at the Ageas Bowl. The channel goes live with Nasser Hussain leading a masterclass to families and kids at the nursery ground as part of the launch show hosted by Laura Woods to bring Sky Sports Mix to life for the first time. Live coverage of the cricket begins at 1.30pm. Real Madrid, world rugby champions New Zealand and the Belgian Grand Prix headline a weekend of some major live sport that will also include European Tour golf and the EFL Sky Bet Championship match between Burton Albion and Derby County on Friday night - all available to every Sky TV customer. Across the first month, Sky Sports Mix will bring live sport every day, with nine different sports shown live including cricket, rugby union, rugby league, golf and football. A further seven sports will be shown non-live showing the commitment to provide an introduction to sport for millions of Sky customers at no extra cost. Sky Sports Managing Director, Barney Francis, said: "It's an exciting moment for Sky Sports as we open up a window to millions more people for the first time. Sky Sports Mix will offer the chance for millions of homes to enjoy a selection of the first class sport we broadcast every day, and we hope that will mean even more people find a sport they love and are inspired to become even more passionately engaged." The launch of Sky Sports Mix means that Sky TV customers will be able to enjoy access to live sport, the widest range of Catch Up TV services, as well as watch the most-talked about shows from HBO and Showtime on Sky Atlantic, Sky 1, FOX and many more exclusive channels. They can access all this whenever and wherever they want - live or on the go, via our mobile TV service, Sky Go. The launch of Sky Sports Mix will further cement Sky Sports' position as the first choice for sport across a range of channels and products. Sitting alongside our award winning channel line-up Sky Sports Mix will be available in the same number of Sky TV homes as Sky Sports News HQ, a channel with an annual reach of 17m viewers. Sky Sports Mix will also complement Sky's growing digital audience, where 35m monthly users engage with a range of Sky Sports products as well as its presence on leading platforms such as Facebook, Twitter, Snapchat and YouTube. Sky Sports Mix will be available to all Sky TV customers (not including NOW TV), as well as on selected Virgin Media packages, as well as providing a significant reach for a selection of the live sport available on Sky Sports at no extra cost.